I’m grooving on gelatin desserts these days. Now that chocolate, nuts and peanut butter are out of my diet, I’ve been at a loss for what to make for our weekly dessert. I recently posted on my personal Facebook wall, asking people to help me brainstorm dessert flavors to get chocolate off of my brain. I kept making the Strawberry Panna Cotta I posted recently and my kids were asking for something different. I had friends post a ton of great suggestions. This is the first dessert that came out of that brainstorming suggestion. I wanted something rich and Springy, and this hit it perfectly. We’ve gone crustless these days, but you could easily pour this into a crust or put it in ramekins and sprinkle some graham cracker crumbs on top. Whipped cream or coconut cream could go on top, too. I love this recipe because it’s got plenty of good fat in it if you’re using cream cheese, and just barely sweet. It’s a nice contrast to the lemon, which cuts through the heavy dairy. It’s rich and clean but not too sweet. For ingredient resource and information, check out our Resources page. 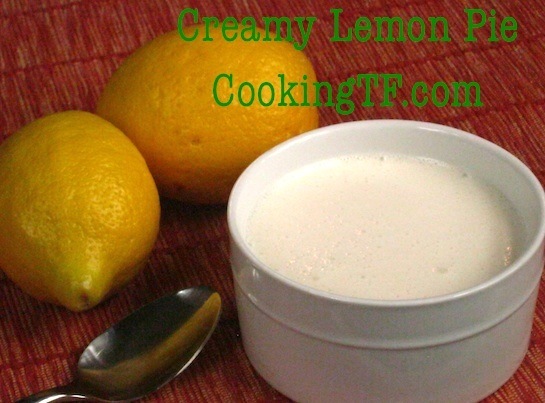 In a blender, combine the cream cheese, lemon juice, 1/2 cup of the coconut milk, honey and vanilla extract. Process just until smooth and set aside. Pour the remaining 1/2 cup of coconut milk into a saucepan and sprinkle the gelatin in a thin layer over the top. Allow to sit until dissolved, 5-10 minutes, then whisk in the gelatin. Heat over medium heat until boiling, whisking regularly. Be careful, coconut milk can boil over easily. Remove from heat. Turn the blender onto low speed and pour the gelatin mixture into the blender in a slow, steady stream. Stop, scrape the sides down if necessary, and taste. Adjust the sweetness and briefly blend again. Pour into ramekins, a bowl or a pie crust and cover. Refrigerate until firm. Shared at The Shabby Creek Cottage, Rattlebridge Farm, The Shabby Nest, The Prairie Homestead, Skip to My Lou, The Better Mom, Real Food Forager, Simply Sugar and Gluten-Free, Chef in Training, Not Just a Housewife, Naptime Creations, Whole New Mom, Raising Homemakers, We Are that Family, Frugally Sustainable, The Nourishing Gourmet, and The Nourishing Gourmet. Do you think you could freeze this? Looks yummy and refreshing which is what we need at this time of the year. I also think about chocolate all the time. Laurie, I haven’t tried freezing it and I’m not sure it would work. I’m concerned the gelatin might break in the freezer and make it weep. However, it might make a good frozen dessert. I’d have to try it. This looks delish!! Gotta go get some gelatin. Is “1 cup” cream cheese an 8oz block? Val, it is. You can use one 8-ounce brick of cream cheese or 1 cup of homemade yogurt cheese. I have always read that gelatin will weaken when boiled, that you heat gelatin just until it is dissolved into its liquid, which doesn’t require that much heat. Willom, I used that technique in testing this dessert, and it resulted in a failed batch. I could only get it to consistently work when I brought it to a boil before adding it to the blender. Love lemon and love that it’s crustless! Thanks for sharing; visiting from Naptime Creations. Since you used cream cheese could you use reg. milk instead of coconut? I was thinking you might be doing dairy free, but with cream cheese it wouldn’t be. Diane, you can make this dairy-free if you use coconut milk yogurt that has been drained into yogurt cheese. Or you can make it with traditional dairy cream cheese or with dairy yogurt drained into yogurt cheese. I would think you could use cream instead of coconut milk, but probably not reg. milk.